As per the latest market forecast report published by Transparency Market Research, titled 'Dried Apricots Market: Global Industry Analysis and Opportunity Assessment 2018-2026', the revenue generated from the global dried apricots market is estimated to be valued at around US$ 537.7Mn in 2018, which is projected to increase at a CAGR of 5.3% during the forecast period (2018-2026). Factors, such as increasing vegan population, growing health consciousness and expanding consumption of dried apricots as evening snacks and in ready-to-cook foods, are the key reasons anticipated to drive the growth of the dried apricots market over the forecast period. Europe holds major share in the consumption of dried apricots and is estimated to contribute around 33.4% value share to the global market over the forecast period owing to its improved supply chain system and increasing health-conscious people in the region. Increased penetration of key dried apricots producers in developing economies makes the dried apricots market highly competitive, resulting in steady launches and expansion of dried apricots products in the dried apricots space. Players, such as Fruits of Turkey, Purcell Mountain Farms and B & R Farms, are well-known for their premium quality dried apricots products. These companies spend enormously on the research and development of dried apricots products and also promote their brands through knowledge-based advertisements, resulting in larger market shares in the global dried apricots market. Apricots are consumed throughout the year owing to their great taste and nutritional value. Apricots are considered to be one of the healthiest foods as they are rich in nutrients, such as carbohydrates, proteins, fats, fibers, vitamins and minerals. In addition, they also contain vitamin A, C, K and B complex and reasonable quantities of organic acids, such as citric acid and malic acid. Fresh apricots have high moisture content due to which they are more vulnerable to texture and taste deterioration. To enhance the shelf life of apricots, they are dehydrated, which makes storage and transportation of apricots easier and economical. Dried apricots are easily available through wider market penetration through various retail formats. Ease of access across the world will play a pivotal role in increasing the consumption of dried apricots during the forecast period. Many food companies use dried apricots in their products and are introducing different types of snacks and bakery products that use dried apricots as a topping. In addition, companies are also offering dried apricots in different packaging formats in their product portfolio to fulfill the demand from a wide range of customers. Convenience packaging also aids in the transportation of dried apricots and their preservation over longer durations. The introduction of e-Commerce has created numerous opportunities for both manufacturers as well as consumers. Manufacturers are using e-Commerce to increase their consumer reach by directly introducing their products to consumers and thus, enhance product penetration in the market. Manufacturers can also gain consumer trust by increasing transparency about the product quality through proper labeling and description, via online channels. This TMR report contains the current trends that are driving each market segment and offers detailed insights and analysis into the potential growth of the global dried apricots market. The last part of the report includes the competitive landscape of numerous market players to provide a comprehensive and comparative dashboard. Major players covered in this report include dynamic manufacturers who are currently present in the dried apricots market. 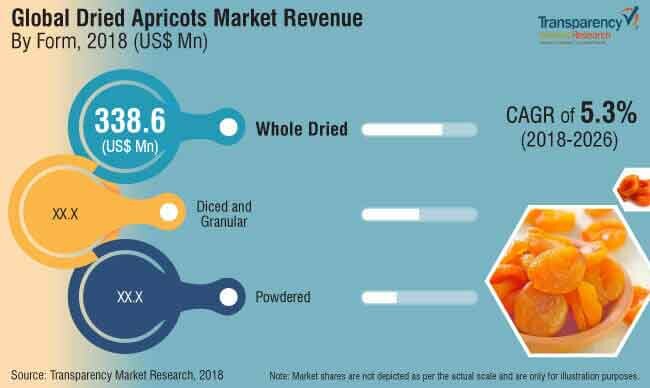 A detailed view of the manufacturers has also been provided under the scope of the report to examine their short- and long-term strategies, recent developments and key offerings in the dried apricots market. TMR has profiled some of the prominent companies active in the global dried apricots market, such as Fruits of Turkey, Purcell Mountain Farms, B & R Farms, LLC, King Apricot, JAB Dried Fruit Products (Pty) Ltd, Bergin Fruit and Nut Company Inc., Sun-Maid Growers of California, Traina Foods, Inc., Sunbeam Foods Pty Ltd., Red River Foods Incorporated, Royal Nut Company, Montagu Dried Fruit And Nuts (Pty) Ltd, Vkc Nuts Private Limited, Food to Live, Lifefood, Chelmer Foods Limited and others. Several manufacturers are entering new markets by acquiring major regional players to enhance their product offerings and manufacturing facilities. Moreover, companies are currently focusing on opening new innovation and development centers to expand and boost their regional and manufacturing capabilities in targeted countries and enhance their presence accordingly.